Private equity golf clubs offer amenities not available at most public venues. The wide variety of opportunities to play golf ranges from daily pay-for-play public courses to exclusive member-owned clubs. The choice is largely governed by economic considerations. Member-owned, equity clubs are the most exclusive and the most expensive, but they usually offer amenities not available at less expensive venues. Equity is defined by “Dictionary.com” as “ownership, especially when considered as the right to share in future profits or appreciation in value.” An equity member thus owns a portion of the golf club along with the other members. This gives the member the right to use the club’s facilities, along with the right to have all or a portion of his equity interest returned when he leaves the club. Not all private clubs are equity clubs. There are private clubs that are owned by an individual or company. These are not equity clubs and the initiation fees are generally not returnable when the member leaves the club. The initial membership fee can range from about $5,000 to over $250,000 for the most exclusive clubs. Some clubs separate the fee into a portion that represents the refundable equity interest and a portion that represents a contribution to capital that is not refundable. Once a person becomes a club member, she must pay annual dues; the amount depends on the number of members and the costs of operating the club. Clubs with fewer members are more exclusive and more expensive. If the annual dues are insufficient to cover operating costs and capital improvements, members are assessed additional amounts to make up the shortfall. In addition, most equity clubs have a requirement that a minimum amount must be spent each year on food. If the minimum is not reached, the member is charged for the difference. Many clubs also charge additional amounts for golf cart usage, locker room use and club storage. Fewer members mean more availability of playing times. Some public golf courses require that you reserve a tee time in advance, and the time you desire might not be available. Many equity clubs do not require that you reserve a starting time, but even if they do, the fewer number of players make desirable starting times more available. 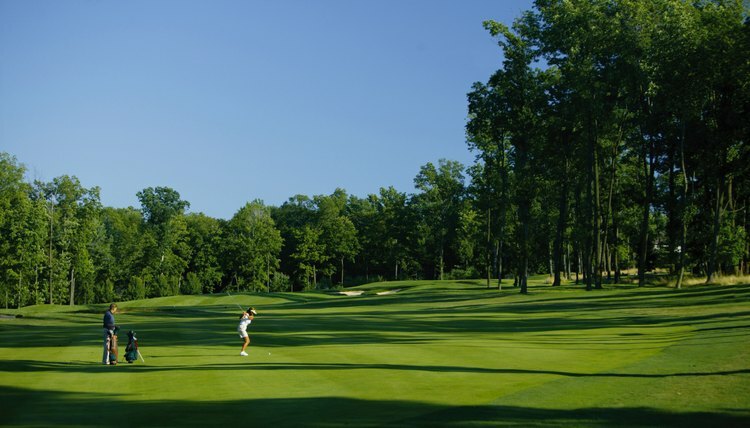 The condition of an equity golf course is generally much better than that of most public courses, because there is more money available for maintenance and because fewer players put less wear and tear on the course. For the same reason, the facilities and food might be of much higher quality than those offered at a public course. If you have an opportunity to become a member of an equity golf course, play the course, dine in the club's restaurant and meet some of the members. You might find that the course and your skill level are incompatible or the dining experience is not to your liking. Perhaps most important, decide whether the membership consists of people who will welcome you and with whom you would enjoy socializing.